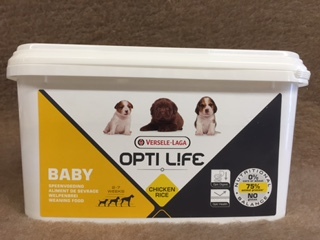 Opti Life is a premium dog feed put together by nutrition experts and only contains the very best ingredients. All OptiLife feeds are based on rice, a high-quality and easily digestible ingredient. No maize or wheat is used in the formulas. In addition, all used protein sources and fats come from animals suitable for human consumption. Besides the quality of the ingredients the production process of course also plays a big role to guarantee high quality nutrition. All feeds are produced according to the strictest hygiene standards, as they are applied in production for humans. Our own production unit has an IFS (International Food Standard) certificate, issued by an independent body. This standard is based on the HACCP quality assurance. There are thus many factors that you have to take into account when you want the right food for your dogs. This nutrition guide gives you a better insight into the range, the composition and specific properties of our Opti Life products. It contains some useful guidelines and handy tips that help you choose the right nutrition for your dog.